A fire pit can be used for a lot more than just fires. Chilly nights are perfect for gathering around the fire with the ones you love. Whether entertaining friends or just having a family night around the fire making s’mores and memories, a fire pit is the perfect place to gather. Fire pits add warmth and ambiance to any setting. They radiate a great deal more heat than an outdoor fireplace because the heat can radiate out in multiple directions. 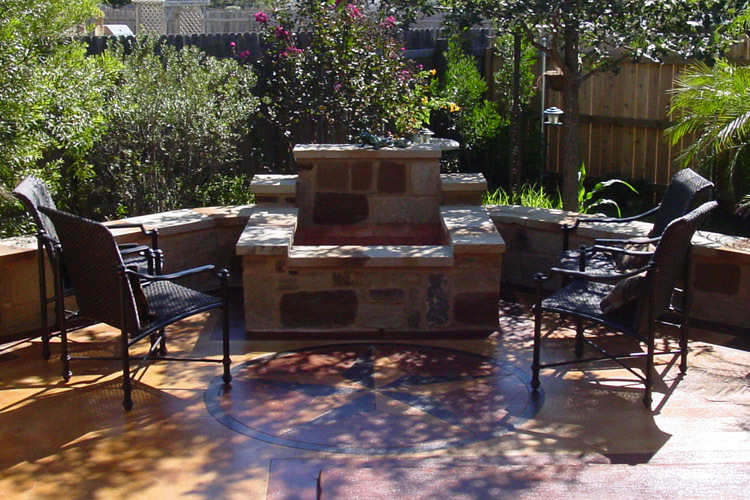 October through April in the Texas area, is the time frame you want to add a heated spot to your outdoor get together. The ambiance factor can be used year round by using a low fire in the fire pit for ambiance and it is perfect for roasting those marshmallows. A fire pit is also considerably cheaper to build than a fireplace. In most cases the cost can be up to 75% less than a fireplace. There are numerous design options and materials to choose from when considering the addition of a fire pit. Fire pits can even be equipped with gas and use beautiful glowing glass fire rocks which come in different colors. You can even install a gas star in your fire pit, you guessed it, the flame comes out in a star pattern. With all the versatility and choices of fire pits you can capture the effect and glow of the outdoor fire without sacrificing your budget. This fire pit built by Archadeck of Austin is a great example of all the beauty and versatility available when planning your fire pit. This fire pit is unique in it’s shape and function. Not only can this fire pit be used for fire, it also has the capability of doubling in the off-season months as a water feature or planter. Incredible versatility was integrated in the design by choosing a corner location for additional seating. This fire pit is also outfitted with a sconce light. If you don’t want to turn up the heat you can always turn up the mood with this gorgeous fire pit. The fire pit was built atop a stained and scored concrete patio which is all the rage right now. We recommend a broom finish, to avoid slippage and it also allows the stain to appear bolder, resembling a matte finish instead of a shiny finish. The stain color was created to complement the color of the stone used in this project. The cap was done in sandstone, which has lots of veining. On the base and walls we used two different types of flagstone. We used 25% Oklahoma taupe and 75% autumn blend. Autumn blend looks great with sandstone. We tied it all together with a scored ribbon of one color that goes all the way around, we always use a scored ribbon in this manner. This particular job also entailed an outside bar with a granite cap. On the other end we built a beautiful 12’ bench with an arch and built-in planter. This job came together like beautiful pieces of a puzzle. One feature flowed effortlessly into another to create ease of enjoyment and ambiance. Give Archadeck of Austin a call to plan and build your next outdoor structure. We can create an outdoor oasis in your backyard too. This entry was posted on March 14, 2011 by austinporchandpatio. It was filed under Austin fire pits, Austin outdoor bar, Built-in benches, Flagstone and was tagged with Archadeck of Austin, Archadeck of Austin design, Austin flagstone patio, Austin Oklahoma flagstone, Austin outdoor fire pits, Water features.